Sand Point is located on the northwest coast of Popof Island. Popof Island is in the Shumagin Island group located south of the Alaska Peninsula, and is near the entrance to the Bering Sea. The island is 16 km (10 miles) long and 8 km (5 miles) wide. Sand Point can be reached by plane or boat. Its Aleut name is Qagun Tayagungin. There are three local tribes: Qagan Tayagungin Tribe of Sand Point, Unga Tribal Council, and Pauloff Harbor Tribe. The village has a population of around 1200, about half of which are Aleut. Its first residents were Aleuts from nearby villages and Scandinavian fishermen. Sand Point has one of the largest commercial fishing fleets in the Aleutians. As well, a small herd (about 120 head) of bison roams freely on the uninhabited side of the Island. Traditional harvest includes fish, marine mammals, terrestrial mammals, marine invertebrates, birds, eggs, and edible plants. Arlene has been the steering committee member since the beginning of the pilot phase of BSSN. 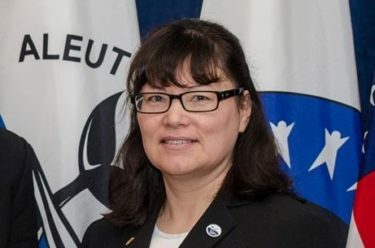 She is the former board president of Aleut International Association and has served on numerous other boards within the Aleutian region. Stay tuned for more about Lucinda! Stay tuned for more about Mikal!